Spend Spring Break in adventure mode! 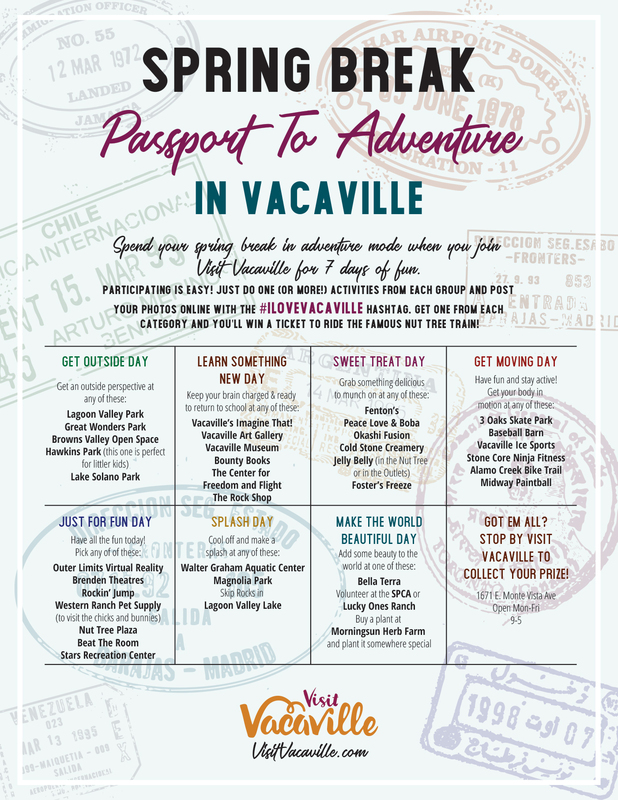 Join Visit Vacaville as we journey through seven days of fun ways for kids to spend their time away from school. Participating is easy, just pick one or more ways to celebrate each day and then get out there and have some fun. Snap photos and post them with #ilovevacaville and win a ticket to ride the famous Nut Tree train when you get one in each category. This one is easy. Get out and enjoy Vacaville’s rolling hills, dramatic scenery, and expansive skylines at any of these beautiful parks: Lagoon Valley Park, Great Wonders Playground (Andrews Park), Browns Valley Open Space and the Browns Valley Boulders, Hawkins Park (a great choice for smaller children), or Lake Solano Park. Slurp on something sweet to celebrate this day, bonus points if you try something you’ve never had before! Head over to any of these local favorites: Fenton’s, Peace Love & Boba, Okashi Fusion, Cold Stone Creamery, Jelly Belly (in the Nut Tree or the Outlets), or Foster’s Freeze. Keeping active is nothing but fun when you visit one of our choices for this day. Pick a sport, any sport and celebrate this day at one of these: 3 Oaks Skate Park, Baseball Barn, Vacaville Ice Sports, Stone Core Ninja Fitness, the Alamo Creek Bike Trail, or Midway Paintball. Because you’re still on break. Go ahead, you deserve it. Pick any one of these: Outer Limits Virtual Reality, Brenden Theaters, Rockin’ Jump, Western Ranch Pet Supply (to visit the chicks and bunnies), Nut Tree Plaza, Beat the Room, or Stars Recreation Center. Summer fun starts early on this day. 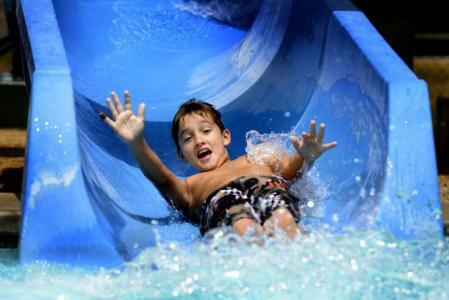 Whatever the weather, Vacaville has a few great ways to make a splash: Walter Graham Aquatic Center, Magnolia Park, or skipping stones at Lagoon Valley Lake. Add some beauty to the world by creating something lovely, helping something grow, or donating your time to make an animals life better at any of these: Bella Terra, volunteer at the SPCA or Lucky One's Ranch, or buy a plant at Morningsun Herb Farm and plant it somewhere special. Have you got them all? Post your photos using #ilovevacaville and then stop by our Visitor’s Center to collect your prize! Summer temps are soaring, so we rounded up our favorite ways to stay cool! 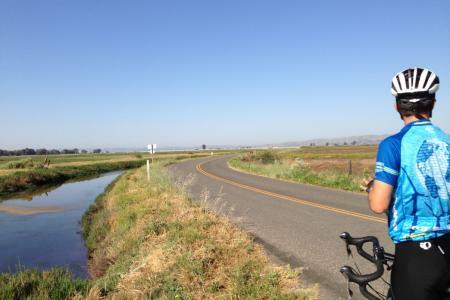 Explore the best of Solano County’s roads and trails by bike. 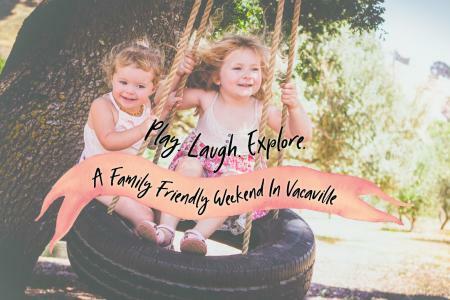 Vacaville prides itself on being one of Northern California’s most family friendly destinations. You and your children will love our selection of local attractions, fun events and celebrations, and parks and picnic areas. Visit the tasty and magical world of the Jelly Belly Factory. Attend one of our exciting food festivals or historic celebrations. In Vacaville, boredom is hard to come by.